As he prepared for his recent trip abroad, Barack Obama fleshed out his plan to remodel the U.S. imperialist presence in the Near East region. In a July 14 New York Times op-ed piece, the presumptive Democratic presidential candidate called for “redeploying” troops from Iraq while maintaining “a residual force” in that country that could total as many as 50,000 troops. He also called for dispatching two U.S. combat brigades—as many as 10,000 soldiers—to Afghanistan, in addition to the 32,000 U.S. troops already there. In his July 24 speech before an enormous crowd in Berlin, Obama appealed to the European powers to send more troops to Afghanistan, declaring: “America cannot do this alone.” By all indications, Obama’s trip achieved its purpose: demonstrating that, as president, he would be quite effective in furthering the interests of U.S. imperialism. Obama’s trip took place at a time when the situation facing U.S./NATO forces in Afghanistan had become, as he put it, “precarious and urgent.” June was the deadliest month for U.S. troops in Afghanistan since the war began in late 2001, a result of what U.S. commanders say is a 40 percent increase over last year in insurgent attacks. Republican and Democratic politicians nowadays like to rail against Islamic fundamentalism. But not so long ago, the U.S. bourgeoisie, including the liberals who were tailed by most of the left, heralded Islamic reactionaries as “freedom fighters,” as the CIA doled out billions to the mujahedin fighting the Soviet Army in Afghanistan in the 1980s. This was the largest covert operation in CIA history, and included aid to Osama bin Laden, who would later turn on his former masters. In mid-July, U.S. troops abandoned a military outpost in eastern Afghanistan after some 200 insurgents almost overran it, killing nine U.S. soldiers. It was the deadliest one-day loss for U.S. forces in Afghanistan in the past three years. U.S. commanders in Afghanistan have sought to counter the push by insurgents with stepped up airstrikes, causing a skyrocketing number of civilian deaths. According to Afghan officials, more than 70 civilians have been “mistakenly” targeted by U.S. bombs and missiles in July alone. Among them were at least 47 people in eastern Afghanistan, mostly women and children, who were killed as they traveled to a wedding party. Meanwhile, in recent months, U.S. forces have carried out a number of airstrikes, often with the approval of the Pakistani military-backed regime, within Pakistan itself. This is similar to the policy of U.S. military incursions into Pakistan’s western tribal regions that is advocated by Obama. On May 14, a Predator drone hit the village of Damadola near the Afghan border, killing more than a dozen people. On June 10, U.S. planes hit a Pakistani border post, killing eleven soldiers. Many enraged Pakistani military commanders saw that U.S. attack as a deliberate act intended to “punish” Pakistan for not preventing insurgents from crossing into Afghanistan. The Afghanistan war, which was embraced by liberals as a “just” response to the September 11 terror attacks, has meant continued brutal oppression of women as well as warfare among the various tribal warlords. Afghanistan’s imperialist overseers brokered a constitution that effectively enshrined Islamic fundamentalist sharia law, while in Iraq Islamic clerics are granted authority to strike down “un-Islamic” laws. The Spartacist League, U.S. section of the International Communist League (Fourth Internationalist), stood for the military defense of Afghanistan and Iraq against imperialist attack without giving any political support to the reactionary, woman-hating Taliban cutthroats or the capitalist dictatorship of Saddam Hussein. We underlined that every victory for the imperialists in their military adventures encourages more predatory wars; every setback serves to assist the struggles of working people and the oppressed the world over. Today, we call for the immediate and unconditional withdrawal of all U.S. troops and bases from Iraq, Afghanistan and Central Asia! As proletarian-internationalist opponents of U.S. imperialism, we recognize that when the insurgents in Iraq and Afghanistan aim their blows against the U.S. occupiers and their lackeys, such acts coincide with the interests of the international proletariat. But we do not imbue the forces presently organizing guerrilla attacks on U.S. forces with “anti-imperialist” credentials. We have stressed from the beginning that the chief means of defending neocolonial Afghanistan and Iraq against the overwhelming military might of American imperialism and its allies is through international working-class struggle, especially by the multiracial U.S. proletariat. The bombings in Afghanistan and the devastation of Iraq have gone hand in hand with the capitalist rulers’ onslaught against working people, minorities and most everyone else domestically. 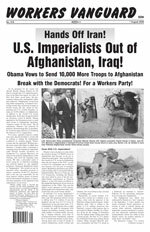 The “war on terror” that served as the pretext for the occupations has led to the shredding of democratic rights and a massive increase in the repressive powers of the capitalist state.
. We’re loyal to America.” Such vile “America first” chauvinism was a pledge of allegiance to the bloody U.S. occupiers against the peoples of Iraq and Afghanistan. For their part, the various antiwar coalitions—United for Peace and Justice, ANSWER, Troops Out Now and Not In Our Name—were built by the reformist left on a class-collaborationist and social-patriotic basis, preaching the lie that imperialist war can be ended under capitalism. The purpose of these coalitions has been to forge a political alliance with “peace loving” sections of the bourgeoisie, i.e., liberal Democrats. Thus, such actions as were organized by these coalitions never called for military defense of Iraq and Afghanistan against American imperialism, limiting their slogans to pacifist “No to War” appeals to the imperialist rulers. Typically, the various “peace” coalitions call for a reordering of the bourgeoisie’s priorities: money for education, not war, etc. However, the capitalist system cannot be pressured or reformed to work in the interest of human needs. The relentless drive for profits and spheres of influence by the rulers of the U.S. and other big capitalist powers necessarily results in wars and neocolonial pillage. Imperialist aggression and war are not “policies” that can be ended within the framework of capitalism—the entire system must be overturned. Only by wresting the means of production from the hands of the capitalist imperialist rulers and creating an international planned economy can the needs of the billions of toilers now consigned to hideous poverty begin to be met and the threat of war ended once and for all. Two months before Obama’s visit to Baghdad, the Christian Science Monitor (14 May) revealed details of a meeting in early April of Iraqi president Jalal Talabani and other top Iraqi officials with Iran’s Brig. Gen. Qassen Suleimani, the head of Iran’s Islamic Revolutionary Guards Quds Force, a paramilitary group that American officials say is backing Shi’ite militias in Iraq. The article quoted an American official who said that Suleimani “promised to stop arming groups in Iraq and to ensure that groups halt activities against US forces” and was “willing to ‘send a small team’ to ‘discuss any issue’ with the Americans.” Indeed, Iran is credited, including by Washington’s quisling Iraqi regime, with having used its influence to have al-Mahdi Army leader Moqtada al-Sadr order his forces to stand down after fierce fighting between his Shi’ite militia and government troops earlier this year. In a provocative move in early June, Israel staged a major military exercise in the Eastern Mediterranean that was widely described as a “dress rehearsal” for an attack against Iranian nuclear facilities. Iran responded in early July by test-firing long-range missiles in the Persian Gulf, including one that Tehran said had the range to reach Israel. Meanwhile, on July 19 a high-ranking State Department official joined negotiations between the European Union and Iran, despite the Bush administration’s insistence for years that it would not engage in direct talks unless Tehran first suspended its enrichment of uranium. U.S. officials also leaked the fact that Washington was seeking to establish a diplomatic presence in Tehran for the first time since relations were severed nearly three decades ago. We are in no position to judge the likelihood of an impending U.S. or Israeli attack on Iran. As revolutionary opponents of U.S. imperialism, we oppose any economic sanctions against Iran, which are an act of war. The Iranian government says that it does not plan to develop the bomb. In fact, given the threats by the imperialists, it would be perfectly reasonable and necessary for Iran to pursue getting nuclear weapons and adequate delivery systems to deter attack. In today’s world, possession of nukes has become a necessary means of maintaining national sovereignty. In the event of military attack against Iran by the U.S. or by Israel—the only nuclear-armed country in the Near East—operating on behalf of the U.S., it is in the interest of the international proletariat to stand for the military defense of Iran without giving an iota of political support to the reactionary Tehran regime. We Said: Hail Red Army in Afghanistan! The insurgents the U.S. faces in Afghanistan today are Frankenstein’s monsters turned on their former masters. U.S. aid to the Afghan mujahedin began in the late 1970s under the Carter administration, which had launched an anti-Soviet “human rights” crusade. The Islamic fundamentalist mujahedin were in rebellion against the pro-Moscow People’s Democratic Party of Afghanistan (PDPA), which took power in April 1978. The PDPA sought to implement some minimal reforms to bring Afghanistan closer to the 20th century: land distribution, freeing women from the burka (the head-to-toe “veil”), reducing the bride price to a nominal sum and providing education for girls. These basic reforms sparked a ferocious rebellion by landlords, tribal chiefs and mullahs who launched a jihad (holy war), burning down schools and flaying teachers alive for the “crime” of teaching young girls to read. When the PDPA requested assistance from Moscow in quelling this bloody rebellion, the Soviet Army intervened, acting to defend the USSR’s southern border against the CIA-backed insurgency. This was the first war fought in modern history where the status of women played the central role. The Soviet intervention was unambiguously progressive, underlining the Trotskyist understanding that despite its degeneration under a Stalinist bureaucratic caste, the Soviet Union remained a workers state embodying the historic gains of the October Revolution of 1917, centrally the planned economy and collectivized property. These were enormous gains, not least for women and the historically Muslim peoples of Soviet Central Asia, where conditions before the Bolshevik Revolution had been as backward and benighted as in Afghanistan. A Red Army victory posed the extension of the social gains of the October Revolution to Afghanistan through a prolonged occupation and the country’s integration into the Soviet system. Though undertaken purely for defensive geopolitical reasons, the Soviet military intervention cut against the grain of the nationalist Stalinist dogma of “socialism in one country.” The Red Army troops, many of them recruits from Soviet Central Asia, who fought against the CIA-backed mujahedin believed they were fulfilling their internationalist duty. And so they were! This military intervention also offered the prospect of reanimating the Bolshevik program of proletarian revolutionary internationalism in the Soviet Union. Pointing to the Stalinist bureaucracy’s capacity to betray, we stressed at the time that a genuinely internationalist perspective toward Afghanistan required a workers political revolution to oust the Stalinist bureaucracy and return the Soviet Union to the road of Lenin and Trotsky. When then-Soviet leader Mikhail Gorbachev, in a vain attempt to appease the imperialists, withdrew forces from Afghanistan in 1989, we denounced this as a crime against both the Afghan and Soviet peoples. That betrayal by the Kremlin bureaucracy opened the road to mujahedin rule in Afghanistan and prepared the ground for the counterrevolutionary destruction of the Soviet degenerated workers state itself in 1991-92, a historic defeat for the proletariat and the oppressed around the world. In contrast, the ISO declared: “Just as socialists welcomed the defeat of the U.S. in Vietnam, we welcome the defeat of the Russians in Afghanistan. It will give heart to all those inside the USSR and in East Europe who want to break the rule of Stalin’s heirs” (Socialist Worker [U.S.], May 1988). When the Soviet Army intervened into Afghanistan, we wrote in Spartacist (English-language edition) No. 27-28, Winter 1979-80: “Although uncalled for militarily, a natural response on the part of the world’s young leftists would be an enthusiastic desire to join an international brigade to fight the reactionary CIA-connected rebels.” In the face of the Stalinists’ criminal withdrawal, the Partisan Defense Committee, a non-sectarian, class-struggle legal and social defense organization associated with the Spartacist League, wrote to the PDPA government offering “to organize an international brigade to fight to the death” against the forces of Islamic reaction. The PDC’s offer was declined, but at the request of the government, the PDC and its fraternal defense organizations internationally organized a fund drive to aid the civilian victims of the all-out mujahedin offensive against the city of Jalalabad. In three months, over $44,000 was raised, overwhelmingly from small donations from thousands of people, many of them immigrant workers and women in Muslim communities throughout West Europe and North America. The siege of Jalalabad was defeated. The PDPA hung on for another three hard-fought years until 1992, when the mujahedin finally took Kabul. Four years later, the Taliban took over the country. While the bulk of the left internationally stood on the side of counterrevolution, we of the International Communist League fought to the end in defense of the USSR and the deformed workers states of East and Central Europe, just as today we stand for the unconditional military defense of the remaining deformed workers states of China, Vietnam, North Korea and Cuba. In East Germany (DDR) in 1989-90, while the disintegrating Stalinist regime of the SED-PDS whined that capitalist restoration should be implemented in a humane manner, we uniquely opposed the capitalist reunification. We called for a red Germany of workers councils (soviets) through political revolution in the DDR and socialist revolution in West Germany. We initiated a massive mobilization, which was then supported by the SED-PDS, in Berlin’s Treptow Park on 3 January 1990 against the fascist desecration of a Soviet war memorial and in defense of the USSR and DDR. In the USSR, we distributed some 100,000 copies of our 1991 statement calling on Soviet workers to “Defeat Yeltsin-Bush Counterrevolution” and urging the proletariat to form soviets under the program of Bolshevik internationalism. The horrors being played out today in Afghanistan are among the starkest expressions of the choice that has been posed since the advent of the imperialist epoch in the latter part of the 19th century: socialism or barbarism. As proletarian internationalists in the U.S., we seek to win workers and youth to the understanding that the most reactionary force standing in the way of human progress is U.S. imperialism, represented by the Republicans and Democrats and their small-time offshoots, like the Greens. We fight to build a revolutionary workers party dedicated to the overthrow of this barbaric system and to the establishment of workers rule.